Temporomandibular joint (TMJ) disorders are very common, affecting over 10 million people in the United States. The temporomandibular joint is the small joint located in front of each ear that attaches the lower jaw to the skull. These joints work in combination with various jaw muscles and ligaments, making it possible to open and close the mouth, chew, speak and swallow. When the temporomandibular joints, jaw muscles and ligaments are prevented from working together properly, a painful TMJ disorder may occur. Grinding at night is becoming more common due to the stresses of our fast-paced world. Many people do not even realize they have this problem and wonder why they wake-up with pain in their jaw, are wearing down their teeth, and are breaking their dental restorations. Nightgaurds can help with these issues. Custom-fitted mouth protectors are individually designed and made in our dental office. First, we will make an impression of your teeth and a mouth guard is then molded over the model using a special material. Due to the use of the special material and because of the extra time and work involved, this custom-made mouth guard is more expensive than the other store bought types, but it provides the most comfort and protection. 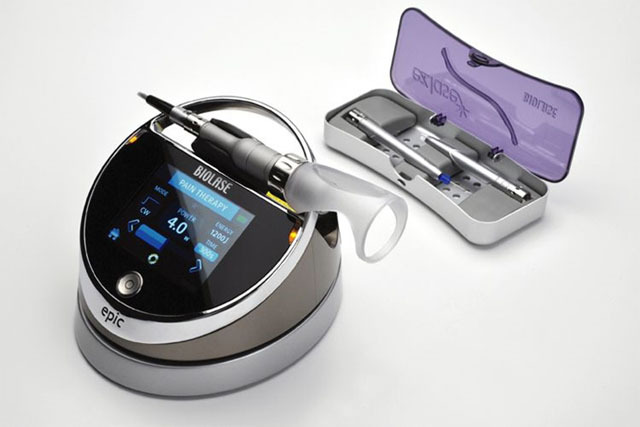 We offer in-office treatments for the pain associated with TMJ disorders with our EPIC™ Biolase diode laser. The FDA has recently given clearance to use this laser for this purpose saying, EPIC diode system emits energy in the near-infrared spectrum to provide topical heating for the purpose of elevating tissue temperature for a temporary relief of minor muscle and joint pain and stiffness, minor arthritis pain, or muscle spasm, minor sprains and strains, and minor muscular back pain; the temporary increase in local blood circulation; the temporary relaxation of muscle.